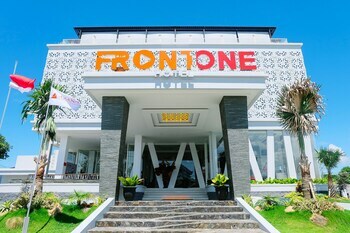 A stay at Front One Hotel Pamekasan Madura places you in the heart of Pamekasan, steps from Madura Island and a 5-minute drive from Arek Lancor Monument. Featured amenities include dry cleaning/laundry services, a 24-hour front desk, and luggage storage. Free self parking is available onsite. With a stay at Wakeup Homestay in Yogyakarta (Central Yogyakarta), you'll be a 4-minute walk from Malioboro Street and 8 minutes by foot from Malioboro Mall. Located in Jakarta, RedDoorz @ Lebak Bulus Raya 3 is within a 15-minute drive of Cilandak Town Square and Pondok Indah Mall. Self parking (subject to charges) is available onsite. With a stay at Airy Kuta Kartika Plaza Samudra 55 Bali in Kuta (Kartika Plaza), you'll be within a 5-minute drive of Kuta Beach and Tuban Beach. Located in Gianyar, Wahyu Dewata Villa is within a 15-minute drive of Pura Samuan Tiga and Taman Nusa. Featured amenities include dry cleaning/laundry services and coffee/tea in a common area. Located in Pakem, ZEN Rooms Km 20 Kaliurang is within a 15-minute drive of Ullen Sentalu and Merapi Golf Course. Free self parking is available onsite.